Product feature: color touch screen panel, easy operation, durable and reliable, large functions. this system can meet the requirements of marking different places at the same time. It can install eight printheads to one host machine to mark 130mm height characters and images, or each printhead has its own printing information and parameter which can work alone. Two sensors could be selected in two production lines simultaneity. It has color touch screen panel Built-in multiple Chinese-English characters which owns the dot matrix fonts and printing fonts. You can adjust the size and height of fonts at random. The special anti-counterfeit font meet the requirement of prevent from fake goods. The anti-blocking nozzle ensures printer long time running with trouble-free. The multiple protection of nozzle prevents the printer from damages caused by scratching and collision. 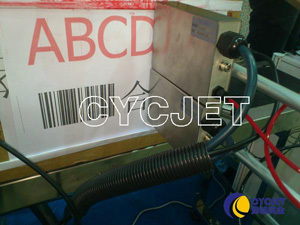 The reliability of ALT550C ink-jet system is superior to other products. Intelligent design: fault diagnosis in automatically and showed by lamp. Modularization design: replace components within 3 minutes, install and maintain easily. The diverse inks formulas are selectable to meet the requirements of strong adhesive and quick drying. Our inks are suit for marking clear characters with strong adhesive in plastic, metal, glasses, paper and wood. It is widely used in industries of chemical, automotive, electronic, food, beverage, building materials, daily necessities, rubber and post office.